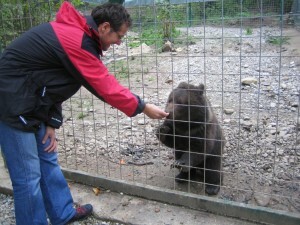 Past volunteer Anne tells us all about life at the bear sanctuary in Brasov. A typical day at the sanctuary goes like this: make it up as you go along. There is no set daily routine, so don’t search for one. Do not try to understand how things work, change or progress from day to day- it will give you a headache and take you round and round in circles. Some days begin with a cheeky shot of palinka or two in the kitchen at 9am. Some days start with loading an obscene amount of rotting fruit and vegetables into the pick up. Some days start with an hour of reading in the living room, sipping excellent coffee whilst mysterious missions are carried out behind closed doors. Other days will see you driving around Brasov from one unknown destination or person to another. Some of these people and places will become known to you; others will remain an irritating mystery. The only constant, upon which you can rely fully, is the bears. At the time of writing, there were 49 bears in the sanctuary. 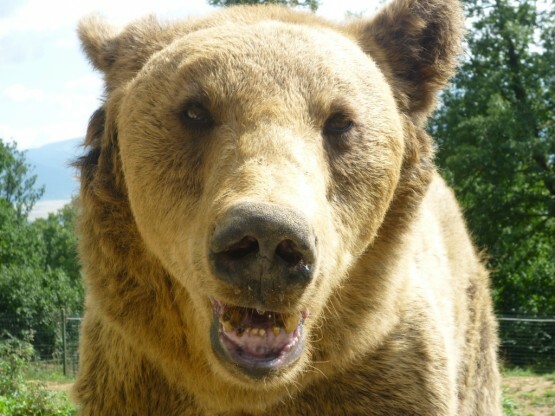 A new enclosure is being built, for there are over 30 more bears in Romania that they know about that they want to help. The stories behind many of these bears are heartbreaking. Max, a 14 year old blind bear, was kept in a restaurant nearby for tourists to gawp over in his tiny cage- he had been blinded by his owners so that he would have a reduced chance of escape. Maya, a female bear kept in such a small cage for such an extended amount of time that she eventually went mad and ate her own leg, is the saddest case- she died before she could be rescued. There are many other heart wrenching stories, but the important thing is that now they are happy. They are free to roam in their natural habitat, safe and well fed, protected from the humans that have tortured their very existence and exploited them to make money. And they look happy- they play together, chase each other, swim, climb trees and roam where they please. Although solitary creatures by nature, they show an amazing willingness to live together and many hours are spent wondering at their size and beauty. You can get within mere metres of the bears; you sit in contemplation with them, as they gaze back at you, their eyes fixed on yours. That is an unforgettable experience. As the time passes by you will start to get to know the bears. You will see how they develop in their environment, becoming more and more accustomed to roaming free and living in the habitat that they were meant to. You will recognise bears by their behaviour. In the cubs enclosure you will witness the hierarchy- identify which bear is ruling the roost and which are submissive to this natural order. You will see Sammy, a light brown cub, scampering towards the food that you have just thrown in for him, only to retreat quickly as soon as another cub comes near, darting up a tree at a remarkable speed, where he will sit, surveying the others eating, whilst sucking endearingly on his paw. You will see them playing happily in their pond, desperately trying to catch the bobbing apples in their paws, before launching in excitement at one of the other cubs to start play fighting, splashing around together before charging off into the undergrowth as their games continue. You can watch the bears sorting through the food that they specifically enjoy, picking up the apples in their paws and munching on it just as a human would. You can watch in amazement as Max, the blinded bear, listens or smells for where his food falls and locate it perfectly with his developed senses. But possibly the most exciting part is seeing the bears in the training area- these bears are the newest and so are kept separate to adapt and to be kept under observation. When they arrive you see them pacing up and down a 3 metre stretch, accustomed only to that small space, and then over time you see them branching out, exploring new terrain and eventually feeling comfortable in their new environment. Once they are at this point, the gates are opened to the large enclosure, and the bears can venture out when they are ready. Whilst I was there the doors were opened, and fights would often break out with the other bears that would invade their territory. Doro and Katie, the bears in the training area together, would band together to defend what they considered to be their home. It was amazing watching Katie, head down, charging towards the invader, followed by Doro standing high on his back legs, snapping down at the unwanted visitor. The new arrival would always retreat quickly. I often sat frozen in fear that one of the bears would get hurt, but it never got that far. Your day will inevitably involve food. The bears need 10kg each in the spring and the autumn, and this takes a lot of preparation. The food which you are working with is usually unpleasant- old stinking salami, sausages, ham, beef, chicken and fish, solid milk, pungent cheese, yoghurt and butter, rotting and wasp infested fruit and vegetables and moulding bread and pastries. All goes in to a large vat and the aromas of each gone-off product mix delightfully to give off a repulsive odour – not ideal on a day when you are feeling off colour. Your hands, hair and clothes will get filthy. The opening and preparing of these products can last hours on end, sometimes in tear-inducing cold conditions until upsettingly late times of day. Interspersed with these hard days, where you might not see anyone else for hours on end, there are the fantastic days. One day we drove 200km to Balan where there is a sanctuary for bear cubs that are being raised like in the wild and will, when they are old enough, be able to live in the wild. We could not see the cubs, as obviously they are being reared with the least human contact possible, but we chatted to the owners in their self sufficient log cabin house, and learned a lot about the cubs. Another day I found myself in the middle of a bear castration, holding a lamp firmly above the bear’s balls as Laci and the vet worked. Some days you are free to roam the sanctuary as you please. One day Laci drove an hour out of his way to show me the mountain pass on which Jeremy Clarkson filmed Top Gear whilst I was here. Twice television crews were at the sanctuary, and twice I got fully involved, even appearing on one of the programmes, describing the work of the sanctuary and my role in it. The occasional group visits allow you to chat with other bear enthusiasts from all over the world, and make them green with envy when you can tell them you have been working with bears for such a long time. However on other days you sit in the car for hours on end, not knowing why, but just being thankful for the essential book that you have with you. Do not take this to be a bad thing. On the contrary, this is all part of the experience of volunteering here. So despite this language barrier, I feel I have found a home here. I make ridiculous mistakes in Romanian, have lovingly nicknamed their dog “Sausage” – which has amusingly caught on, sing along to EuropaFM far too loudly and badly, and we generally laugh a lot. These people are incredible and I love being with them. On my first day I understood not a word, yet felt comfortable in their presence. There are so few people in this world who will give so much, and I feel privileged to be with them. For they will not discriminate on who or what they will help- they have not stopped at the 49 bears, but have extended their love and protection to many other animals- four wolves, four donkeys, 18 dogs, one horse, one deer and a fox- and, despite the vets costs, they did not reproach me for rescuing a puppy I found dumped in the streets, and welcomed him in to the fold. The room that they have in their hearts for these creatures, particularly given the country in which they are living, is humbling. The Romanian bears experience has certainly one of the most eye-opening three months of my life, offering an experience in a beautiful yet corrupt, desperate and saddening country, which has marked me forever, teaching me the value of acceptance, and opening my eyes to what you can do if you have enough conviction and a dream. I also had a fabulous time with the bears too.